Each week I share a reading photo of the week. This is from my final week before the holiday break. One of my little readers is proudly sharing poems from her poem book with an intent listener. We have almost chosen our winners for our Mock Caldecott. But, not quite. It will be the first thing we do when we return. Final voting and tabulating results. 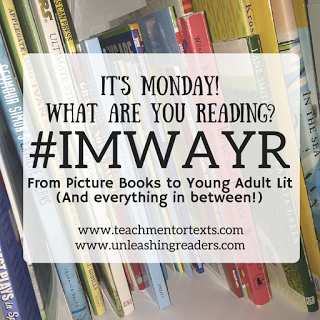 It’s been two weeks since I posted an #IMWAYR post so this post includes two weeks of reading. And since I last posted, I blogged. A lot. An inclusive solution to inviting “someone special” to a special day party. I reserve a really huge place of awe in my picture book heart for illustrator Jim LaMarche. This book is absolutely stunning. Ode to a season. Honouring nature. Celebrating quiet and focus and wonder. I had to buy this book. The simplicity of stopping to “be” with all that is around us. So very lovely. This was the one holiday book I purchased this Christmas. The illustrations are from another time and place. The story is about Marguerite and her quiet life that shifts a little one Christmas Eve. Loved this book. Twelve year old Grayson is navigating middle grade friendships, the grief of losing his parents and the fact that, while born male, he feels female. A school play and an inspiring teacher provide opportunities for risk, change and understanding. A solid middle grade read. A YA graphic novel about summer places, family changes and all of the awkward and in between of sliding into adolescence. I will admit I worried as I began to read this title. Appelt’s The Underneath was just too mythical/magical/spirtual for me. So at certain early on points, I worried. But the balance between Chap’s story and the racoon scouts, soon pulled me in to this beautiful tale. I loved everything about Stella – her courage, her determination, her devotion to family and her journey as a writer. A book about some hard and ugly things (racism and prejudice) with lots of beautiful people to bring us hope. Whoa. A start and don’t put down until done book. Dog as hero. Boy with the weight of the world. Honest truths are the hardest because we don’t often tell them. Beautifully told. Absolutely gripping. I love historical fiction when it is really well done – when the story is enhanced by a time and a setting that literally transports you. In this book, well done is left in the dust. This is excellent writing, an incredible story rich with complex characters living in challenging circumstances. This novel twists from the ugly cruelty of abuse to the powerful healing of connection. It offers up hope and courage mixed with lots of pain. One of the best novels I have read in some time. Goodreads Challenge: 447/415 books read COMPLETE! Diverse Books in 2015: 50/50 books read COMPLETE! This is the final #IMWAYR posts of 2015. Happy New Year and Happy Reading to this wonderfully generous community of book lovers. Like many of you, I will miss the participation of the passionate reader, educator and blogger Debbie Alvarez (Styling Librarian) who passed away last week after a three year battle with cancer. Debbie was one of the first bloggers to welcome me when I dove into sharing my reading life in the blogging world. I learned much by sharing with her and I will miss our book conversations. This entry was posted in It's Monday What are you reading? and tagged Ami Polonsky, Antoinette Portis, Dan Gemeinhart, Holly Clifton-Brown, India Desjardins, Jillian Tamaki, Jim LaMarche, Kathy Appelt, Kimberly Brubaker Bradley, Mariko Tamaki, middle grade novels, Miriam B. Schiffer, Monday reads, Pascal Blanchet, picture books, Sharon M. Draper, Tony Johnston by carriegelson. Bookmark the permalink. I haven’t read any from your list of bests. I’ll have to add them to my never-ending list. Here is what I read last week. Happy reading! Happy Reading Kathy! Aren’t we blessed to have never ending lists!? I have Stellla by Starlight, a ‘need to read’, loved The War That Saved My Life-raced through it, and agree that Winter Is Coming is so beautiful. As I said on your ‘favorites’ post, still need to read The Honest Truth, too. Happy Reading! Winter is Coming is so gorgeous. I love the language and the illustrations. Enjoy The Honest Truth. Quite the story. Stella by Starlight was a terrific book. I love the way the author contrasts the hate coming from the enemies of change with the love and community of Stella and her friends and family. And The Honest Truth is also wonderful. The setbacks that the main character experiences only make him more determined to reach his goal. Hope you have a relaxing week of reading! I agree with your comments about Stella – the sense of community was really beautiful! I too loved The War that Saved My Life. It’s so good! Wow, that was a lot of blogging lately. 🙂 I do so enjoy getting to read your lists so thank you. I know – I didn’t blog as much as usual this fall so made up for it! Thanks Crystal! As always, my TBR list explodes with just one visit to your blog! So many new-to-me picture books here! I surprised myself by really loving True Blue Scouts last year. I generally hate that folksy homespun tone, but it thoroughly worked for me in this book. I’ve tried to read The Underneath a dozen times and end up abandoning every time. Not sure what it is with me and that book. Now I’ve got to find The Honest Truth–I’m all about the gripping read right now! Well I am not going to be the one insisting you read The Underneath, it wasn’t my favourite. The Honest Truth on the other hand . . . wow! I can spend a good portion of my day reading through your posts! Great books read this year! Have a great year ahead! Thanks so much Earl! There were a lot of amazing books this year – love being part of a community with such great recommendations! Gracefully Grayson is one I still need to read. Wonderful books on your list, such great reading this year. I think 2016 will continue the trend! LOVED The War That Saved My Life! I’m adding This One Summer to my list of graphic novels to buy for the new year. I can’t stop thinking about The War that Saved my Life. Such an incredible story! Will be a book I consider rereading sooner than later. I’ve read all the Mock Caldecott possibilities on your shelves (thanks to your recommendations) except Special Delivery. It’s in my book basket. Headed to read it as soon as I post this comment. Currently reading Stella by Starlight, still haven’t read The Honest Truth. I must get to this one. Happy New Year, Carrie! Thanks for all the books you lead me to. I am so thrilled to be able to pass on the book love! My pleasure! I’m glad to have you back & blogging. It is funny but I miss my online friends when life happens and they can’t blog as regularly. And always happy to see a few titles that are new to me on your lists. Thanks Alyson. Feels good to be back and blogging! I love this on line community of book lovers and sharers! I passed Gracefully Grayson on to my daughter who also loved it. You make me so want to read The War that Saved my Life and Gracefully Grayson – most likely in 2016, I will be able to sink my teeth into them. Happy New Year, dear Carrie! I think you will love them both Myra! So much here, Carrie. First, I cannot wait to see who your class votes as your Mock Caldecott winner. Most of the novels you read this week are ones on my TBR list. I might even put some of them on my #mustread for 2016. List making is a comfort and an inspiration! Lovely that we both share this. I also cannot wait to see how we vote for #MockCaldecott! I will be sharing at the end of next week.